We have a very small parking lot next to the church on Westford Street. We try to keep the limited spaces in this lot avaliable for newcomers, visitors, families with young children and those who need to use our handicapped parking spaces. So, if you are new to us please feel free to use this lot. At the intersection of North Road (Route 4) and Academy Street, turn downhill into the small one-way street to Number 9, North Road, beside the small public garden. There is some additional on-street parking on Westford Street and in the center of town. 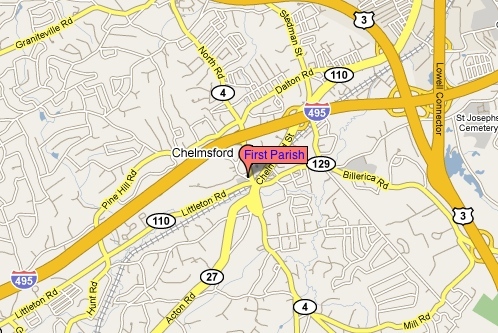 The town has requested that we do not use the spaces behind the old town hall (CCA - Chelmsford Center for the Arts). Please also respect the requests from the owners of 6 North Road, Brickhouse Pizza, The Traveling Rhino, Gingerale Plaza and the strip mall by the CCA not to park on their properties.